February 16, 2007. | Flickr - Photo Sharing! Remixed gray Kenneth Cole dress, under vintage dress from Goodwill by-the-pound, with the remixed faux-bi, tights, boots, and scarf watch (with a different scarf, for once). Whee! such a great look! yummy dress. The faux-bi goes perfectly with the dress, especially as the pattern reminds me of a kimono, sort of a cherry blossom motif. Nicely done! Woo! You are just a sassy cherry bomb in this. Adorable. Absolutely fantastic!!! The dress is amazing!! that caught my eye from the thumbnail! excellent outfit. Great print on the dress - the faux-bi is a perfect match! Hoowhee, thanks y'all! I tell you, Goodwill by-the-pound is a digger's paradise. It makes it hard to go thrifting anywhere else. Some of my other finds are on ebay and I'll be putting more up tomorrow, probably. 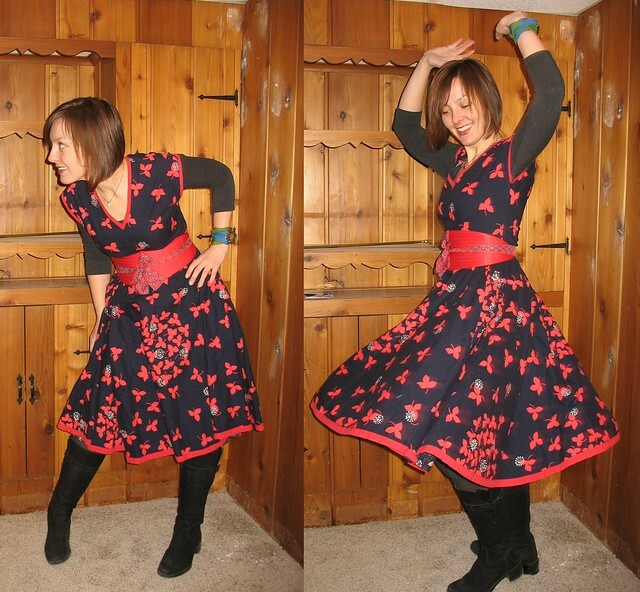 Now, every chick needs a swirly, cheerful dress like that in her wardrobe. Awesome! And I like your scarf watch too. at first I thought the leaves on your dress were butterflies - what a unique double-take print!